(OPride) — Prominent Oromo musician Tsegaye Dandana has been released from Adama Hospital, after weeks of treatment for what’s been described as a bone cancer, according to reports on social media. Tsegaye, who is also known as Sayyoo, is among the pioneers of Oromo musical revolution that took off in the 1970s, a time when, in his own words, “there’s an official one attire and one language” policy. Tsegaye says he took an unusual path to music and prominence. He was born and raised in Ambo, 126 kilometers from Addis Ababa, Ethiopia’s capital. In the late 1970s, he moved to Finfinne with his brother to attend comprehensive school. Tsegaye, who was only 14 years old at the time, recalls hearing Abebe Tessema, Abitew Kebede, Tilahun Gessesse and Ali Birra’s music over the radio, but says he did not have a budding childhood interest in singing. However, as luck would have it, Sayyoo lived near the Police Orchestra in the Kolfe sub-city and consequently struck a friendship with some members of the musical organization. He was invited to a singing audition and subsequently joined the orchestra. The orchestra sent him to a music school where he learned the craft and developed his vocal skills. Sayyoo started singing in 1980 and soon rose to national prominence. There was only a handful of Oromo musicians at the time. 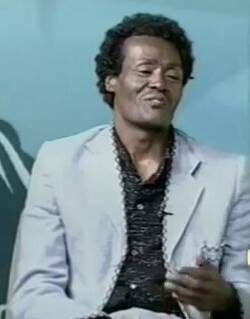 It is no wonder then the young singer changed his given name from Sayyoo to Tsegaye. In those days, many people had to christen their Oromo names into Amharic to fit in and be accepted into the Amhara-dominated system. Sayyoo’s musical training augmented his knack for storytelling. In his now storied career, Sayyoo has recorded and produced at least 80 songs, or 10 albums, all of which were widely received by his largely Oromo audience. The father of two fell ill earlier this year. 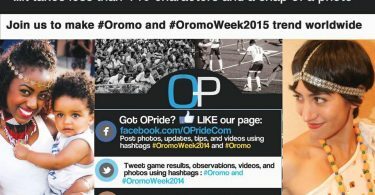 “It gave me a strength to witness the love and support of so many while I am still alive,” he said in an interview with the privately-owned Oromia Broadcasting Service (OBS) last Monday. His magical voice is visibly hoarse, but Sayyoo’s buoyancy and sense of humor appear undiminished. He has a reputation for being charming and always willing to help others. This can be evidenced from his ebullient compliments for the visiting OBS journalists from his hospital bed. Sayyoo now needs your help. There are ongoing efforts to raise funds to cover his medical bills. In some ways, Sayyoo’s sudden ailment is a reminder that the Oromo need civic and philanthropic organizations – both at home and abroad – to respond collectively during such moments of need. 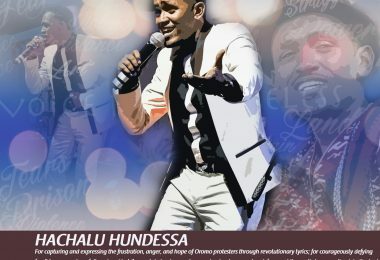 In the past few months alone, Oromo activists have launched similar urgent fundraising drives on behalf of prominent Oromo personalities, including singers Hallo Dawwee, Legesse Abdi, Ibrahim Adam and author and Oromo nationalist Bonsamo Miésso. In each case, the initial diaspora response has been more or less swift but also largely fragmented and individualized. For example, there are ongoing parallel fundraising efforts for Sayyoo, including a gofundme campaign created under a pseudonym, “Tegaye Dandana.” While obviously well intentioned, individual initiatives raise issues of trust and lack clear accountability mechanisms. The creation of a credible, pan-Oromo civic association, designed to respond to such emergencies could remedy those concerns. In another more contemporary song, “Guyyaa 300,” Sayyoo takes on the Ethiopian Orthodox Church’s strictly applied religious prohibitions, calling on Christian Oromos to challenge some of the church’s teachings, including a ban on dairy products during fasting periods. Nearly a decade before Haacaaluu Hundessa released his 2015 hit single, Maalan Jira, Sayyoo poignantly dealt with the forced displacement of Oromo farmers from Finfinne and its environs in the name of urban development. In “Boolee Biyyaa Bulbulaa,” he laments about the estrangement of local Oromos on their own land. The disaffected singer invites the Oromo to the city, which was rightfully theirs then and now. 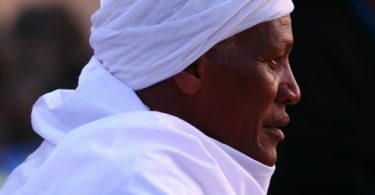 When the elder Bulbula farmed in and around what is now the Bole International Airport, Sayyoo reminds us that 2 birr were enough to go to the city and have a good time (bashanannu). He tells today’s farmers: Don’t be intimidated by the city’s glare and glamor. All you need is 150 birr to spend a quality time in Bole, Garji, Arat Kilo or anywhere else in the city. 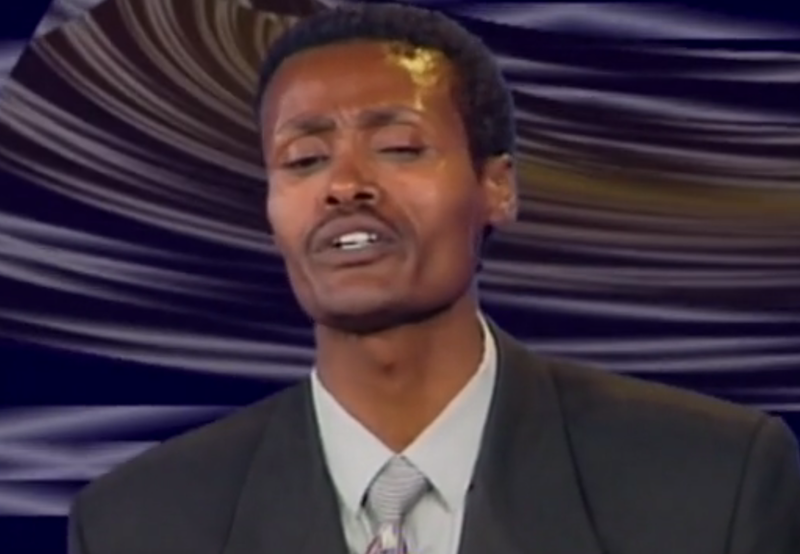 In another widely received song in the early 1990s, Sayyoo sought to define Oromummaa itself. In “Budeeni Oromo furdaan osoo jiru,” he calls out the POWs that made up the core leadership of the Oromo People’s Democratic Organization and those who joined the ruling party for their own personal benefits. He asks the unelected, Afan Oromo-speaking bureaucrats to count their ancestry as per the Oromo custom to corroborate their claims to being Oromo and the right to represent them in an official capacity. To be clear, Sayyoo’s complex musical criticisms were not just partisan propagations of revolutionary ideals. 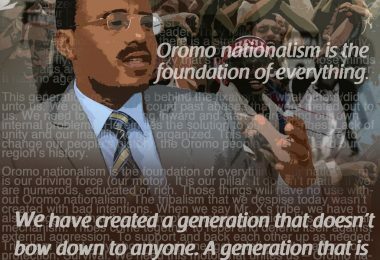 For example, in “Gadaa Oromo shan malee,” he takes Oromo nationalists to task for an intra-Oromo division and factionalism, which continues to cripple Oromo political organizations. In “Maa godaanta,” Sayyoo underscores a conundrum that continues to haunt the Oromo people: yoo tokko siif dhiigu, tokko sirra fiiga — one dies for your freedom while others flee. Sayyoo is also known just as much, if not more, for his apolitical songs. One of my all-time favorites is “Oromoon horii bobbase.” In it, he depicts the life of Oromo animal herders, whose livelihoods are virtually inseparable from the cattle they rear. In sum, it is no exaggeration to say that Sayyoo is the king of Ragada and certainly played a key role in popularizing that genre of Oromo music. Few could sing Ragada with so much authority and a presence that fills up the stage. “I believe an artist should melt like a candle and brighten the path for others,” he told the ETV journalist in 2012. From one of his first songs, “Sutume Yaa Sutume” to “Yaa shiri shiri Boolerra” to “Yaa Shamarmar” and many of his other timeless songs, Sayyoo has lit up the hearts and lives of millions. He’s worked closely with and inspired a generation of Oromo musicians, including the late Solomon Deneke, Meti Jamama, Aster Woldegabriel and countless others. 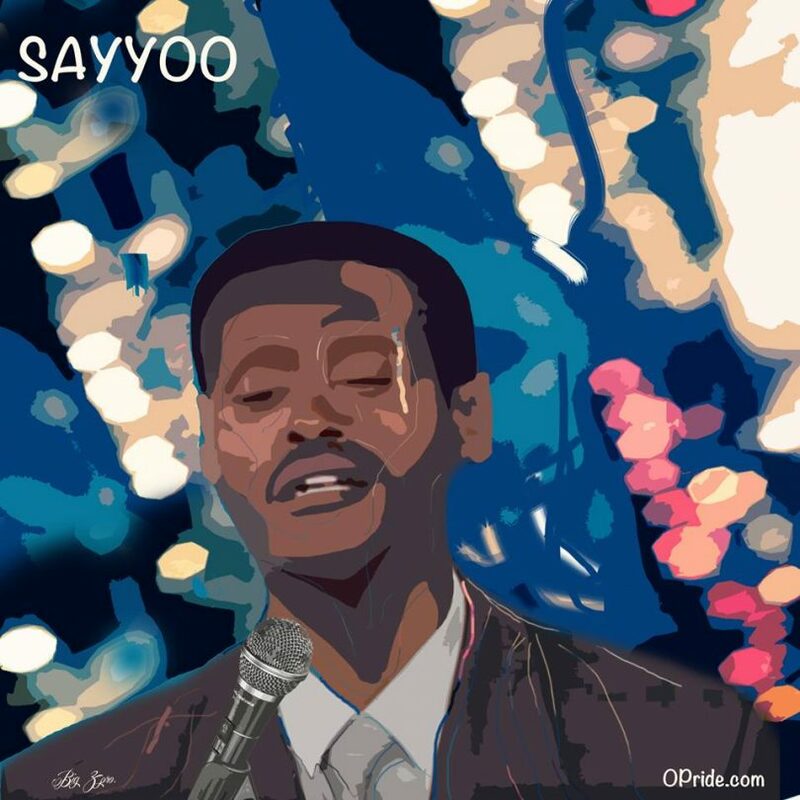 Sayyoo’s contributions to the development of Oromo music has earned him many accolades and awards, including from Oromia Regional State and the Oromia Radio and Television Organization (ORTO). Since Sayyoo’s foray into the world of Oromo music, hundreds of Oromo singers have taken to the stage. But it still pains Sayyoo that there is no single school in the country that’s dedicated to teaching Oromo music. There are very few Oromo music producers or producing houses. There are no organized and functional Oromo music bands. Oromo artists operate in an increasingly hostile political environment that tolerates no form of dissent and implicitly censors the Oromo voice. Many self-censor to avoid imprisonment and loss of business. Others continue to produce critical and revolutionary music at a risk of great personal peril. Most major concerts are organized mostly under the auspices of the government during national holidays. It is often difficult to get a permit to organize a concert. There is no Oromo artists association – at home or abroad – that can coordinate and regulate the sale, quality and distribution of Oromo music. Piracy and copyrights violations are rife and the market for Oromo music lags far behind that of the Amharic language. Artists such as Sayyoo would be self-sufficient if the public takes ownership, buys and supports their work. Even as we scramble to extend our financial assistance to Sayyoo, Bonsamo and others, it is important to be mindful of the need for a reliable and collective response mechanisms. In the interim, those organizing the online fundraising drives should be fully transparent and professional, including by using their real names, offering their contact information and writing a coherent appeal message.